Purple Purple. 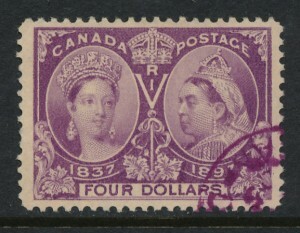 That is to say, the scarce Four Dollar Jubilee purple with a purple postmark. Strictly speaking, perhaps it is a violet postmark, but in any case, as a neat postmark for this lovely example of a Canadian Classic it provides excellent highlighting, leaving the portraits cancel-free. A deep colour Very Fine used cds stamp. For this scarce stamp $1100. Purchase this item from our on-line shopping cart at this link.